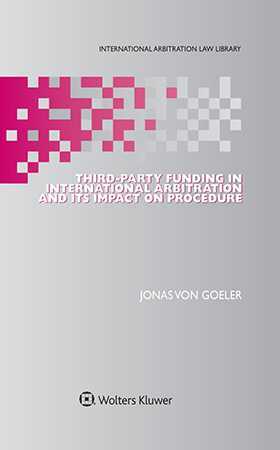 Third-Party Funding in International Arbitration and Its Impact on Procedure is a book that describes and analyses the role of third-party funding, (notably litigation funding), in the context of international arbitration, taking into account contractual, industry-related, economic, empirical, ethical, regulatory, and procedural aspects. Pursuing international arbitration proceedings can be costly and, as a result, it is becoming increasingly common for parties to transfer the costs and risks associated with international arbitration disputes to third-party funders. In recent years, institutional speciality providers of capital for dispute resolution – litigation funders – have entered the market for international arbitration claims. International arbitral procedures involving parties supported by litigation funders and other third-party funders have become a reality. This book examines issues that are likely to arise in the course of international arbitral proceedings involving funded parties and provides guidance on how these issues can be solved. Each chapter offers concrete guidelines on how to deal with the respective procedural issues and situations. This book identifies relevant procedural issues in commercial and investment arbitration, offering concrete guidelines on how to deal with such issues, and also shows how third-party funding affects the arbitrator’s role. This useful book helps to identify and resolve, or forestall pitfalls that may occur in international arbitral proceedings involving funded parties, thereby enabling practitioners to anticipate how third-party funding may affect an arbitrator’s impartiality and independence. This book also prepares for challenges in security for costs and awarding of costs. As the most comprehensive and systematic study of third-party funding in international commercial and investment arbitration to date, this book will be welcomed by professionals in the arbitral community worldwide as well as by funders, funded parties, corporate counsel, and academics. Part I Third-Party Funding in International Arbitration. CHAPTER 2 The Various Forms of Third-Party Funding in International Arbitration. CHAPTER 3 Litigation Funding in International Arbitration. Part II Impact of Third-Party Funding on Arbitral Procedure. CHAPTER 4 Disclosure of Third-Party Funding in International Arbitration Proceedings. CHAPTER 5 Privilege Protection of Documentary Evidence and Third-Party Funding. CHAPTER 6 Jurisdictional Issues and Third-Party Funding. CHAPTER 7 Impartiality and Independence of Arbitrators and Third-Party Funding. CHAPTER 9 Security for Costs and Third-Party Funding. CHAPTER 10 Awarding of Costs and Third-Party Funding. CHAPTER 11 Summary of Part I and Part II. Table of Cases and Arbitral Awards.